Thousands gathered on March 5, 2016, to accompany Berta Cáceres and her family to a spot of spiritual importance to the Lenca known as "La Gruta" and later to Berta's final resting place in the cemetery in La Esperanza. Speeches at La Gruta, March 6, 2016. Berta's long-time compañero and father of her four children, Salvador Zuniga addresses the thousands that accompany the family through the streets of the town where Berta was born and raised. Berta's children, from left to right, Laura, Salvador, Bertita, and Marcela. They are surrounded by their family. La Gruta, La Esperanza, March 5, 2016. A spiritual, indigenous ceremony in honor of Berta. Held at 'Utopia', COPINH's rural community training center. March 5, 2016. 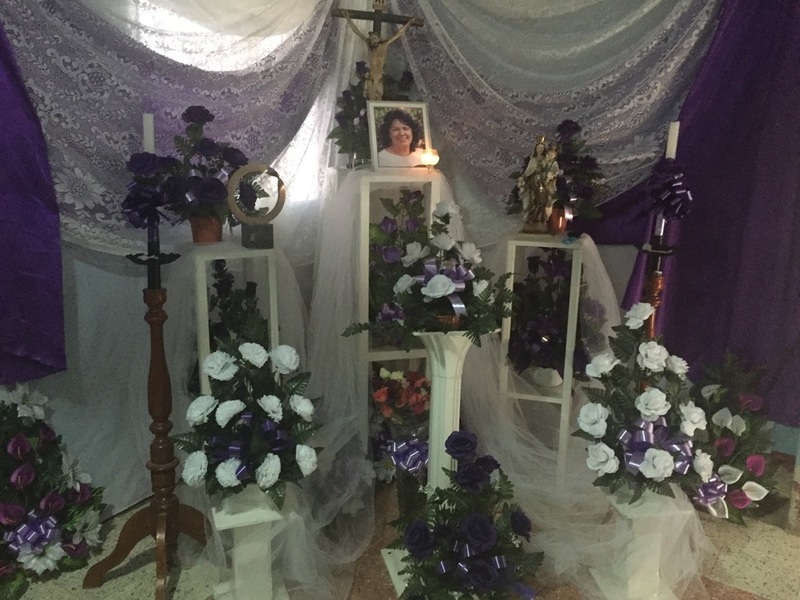 An alter in Doña Berta's (Berta's mom) house in La Esperanza. Berta's Goldman prize was placed to the lower left of her photo. A COPINH protest outside of the courthouse in La Esperanza, to demand justice for Berta's murder. Signs read, "DESA, Berta's killers. COPINH" and on the right, "Berta didn't die, you are a beautiful tree that is giving fruit in abundance."